The church of Il Redentore appears floating on water. Its Palladian façade and perfect lines echo ancient civilizations and compete in their whiteness with the nearby water basin which was once the arrival point of anyone traveling to Venice. Water has stopped flowing and like fog poetically envelops the island. Silence overwhelms everything. 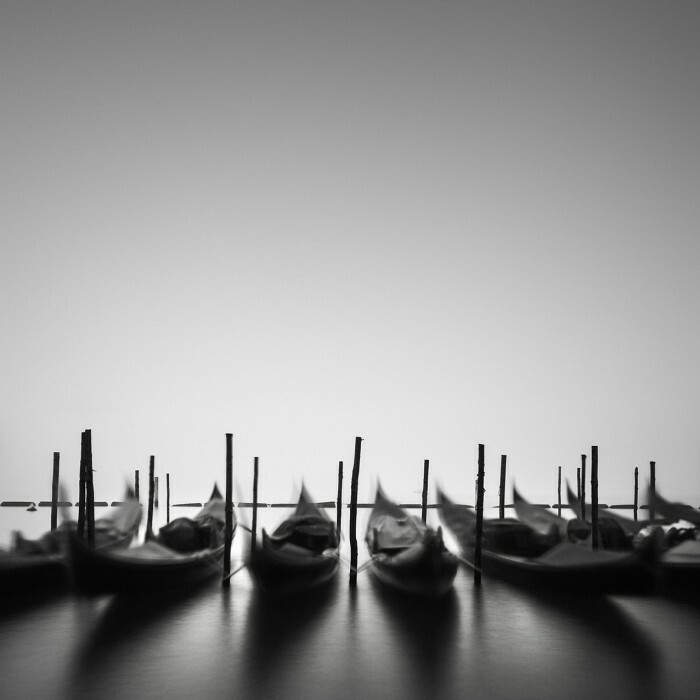 Viewing Venice through the black and white eye of photographer Lisa Katsiaris helps us see Venice in its timeless beauty. 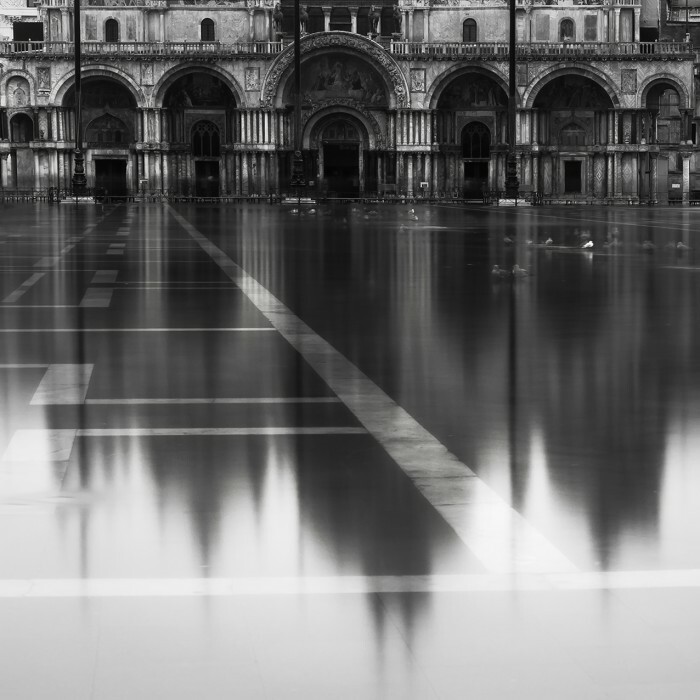 Stripped off of any vulgarity or distracting details, Venice is portrayed as a powerful icon of the harmonious dialogue between architecture, design and nature that has gone on for centuries. And yet, while losing themselves in this dreamy reverie and marvel, readers cannot forget that they are looking at photos of Venice, as the city is today, a contemporary city. Beyond unpleasant noise or cheap souvenirs, masses of people or out of proportion ships crossing the lagoon, in the end the beauty is there. Readers are thus confronted with the dilemma of Venice, a beauty either to preserve or to promote, and will be left wondering which way they can bear respect to this beauty, without violating it any further. Sometimes small steps can do a lot and this book is one of them, promoting a creative solution to witness deep love to Venice and to support those that love it. 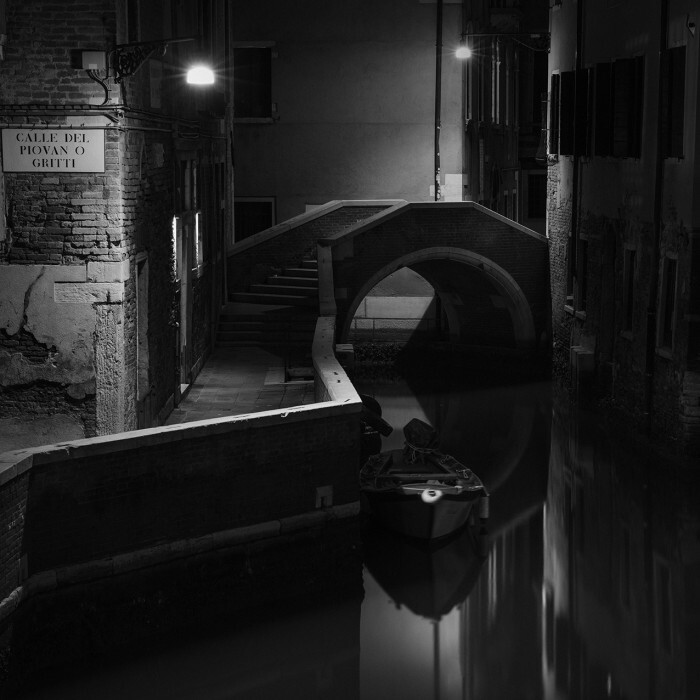 Luisella Romeo interviews Lisa Katsiaris about photographing Venice and her cover photograph for the new book, Dream of Venice in Black and White. Luisella Romeo: Learning you have come to Venice many times, especially in the winter, I am sure by now that the city has inspired you differently. Would you be able to tell us what has changed throughout these years? 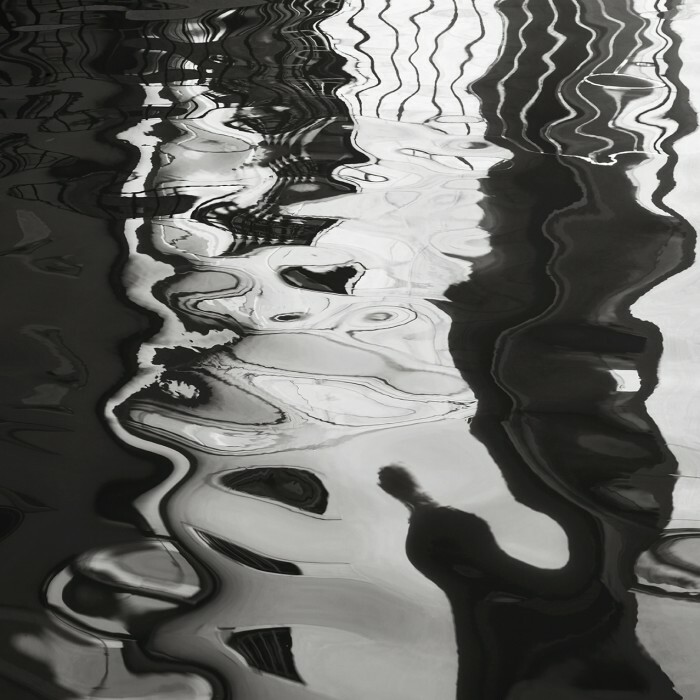 Lisa Katsiaris: I remember coming to Venice as a keen but novice photographer in December 2013. My hotel room overlooked San Giorgio Maggiore and I was so excited I couldn’t sleep; I even set up my tripod and took some photographs at midnight. I was like a child waiting for Santa Claus. Now, after so many trips, my photography is much more considered. The most significant change is how my photography style has developed. It wasn’t until the latter part of 2014 that I started to create minimalist, monochrome images. When I returned to Venice in January 2015, I looked at the city with new eyes. 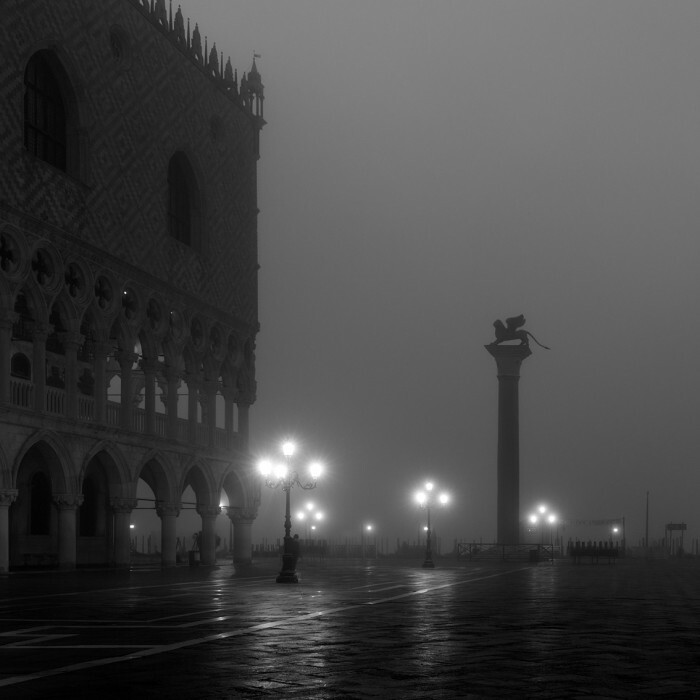 The more I visit Venice, the more I’m able to see beyond the obvious. I’ve also learned that, even if you revisit a place numerous times, nothing is ever the same twice. You can stand in the same spot at the same time of day and get very different results depending on the light and the weather and, importantly, how you feel. LR: You are clearly creating balanced, void and silent spaces in your photography. Less is more, as a rule of aesthetics seems to be underlying your style, stripping down to the essentials of Venice. Before this project with JoAnn Locktov, has your art ever been “social”? Have you ever felt the urge to do something to support Venice “using” your art as a means? LK: Photography is very much something I do for my own enjoyment. I do sell my images, but it’s not something I’ve focused on and it’s only recently that I’ve started to share my images more widely. 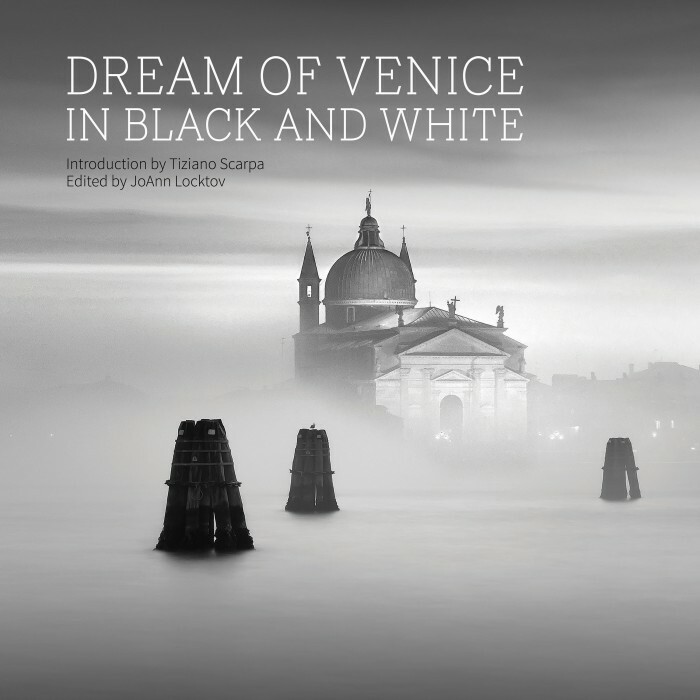 I was familiar with the Dream of Venice books, so when I saw that the next book in JoAnn’s series would focus on black and white images, I was keen to participate. It was delighted when JoAnn confirmed that my image would feature on the cover. Not only is it rewarding to be able to share my work with a wider audience, but also I feel honoured to be part of a project that is benefiting a place that’s so dear to me and to be able to give something back. LR: Talking about ugliness instead. Do you see ugliness in Venice? Like a disease affecting beauty, this is a rather common literary motif in Venice. What is the ugliness that disturbs you? The cheap and not locally produced souvenirs? The empty homes? … Is your photography a refuge away from the ugliness? LK: There is a saying that beauty is in the eye of the beholder; I think the same thing can be said of ugliness. It’s very subjective and can differ widely between cultures. The Japanese aesthetic of wabi-sabi seeks to find beauty in the imperfect, the impermanent and the incomplete. It’s a concept derived from Zen Buddhism that reminds us that we are all transient beings on this earth. In Venice, I’m always seeking out ramshackle fishing huts, broken jetties, crumbling walls and deserted homes. To me, they are deeply evocative and often very beautiful. So rather than thinking of my photography as a refuge from ugliness, I think about it as a way of finding beauty in the ordinary and the everyday. That said, I can find no beauty in the cheap souvenirs sold in the piazza or along the Riva degli Schiavoni. If I were in charge, I would ban them or put the vendor’s stalls to a better use. LR: In a photo anthology that privileges B/W, I guess you expect this question of mine… what is wrong with colours? LK: There is a quote in Antoine de Saint-Exupéry’s Terre des Hommes: ‘Perfection is attained not when there is nothing left to add, but when there is nothing left to take away’. I find colour distracting and one of the elements that I can remove from my images. 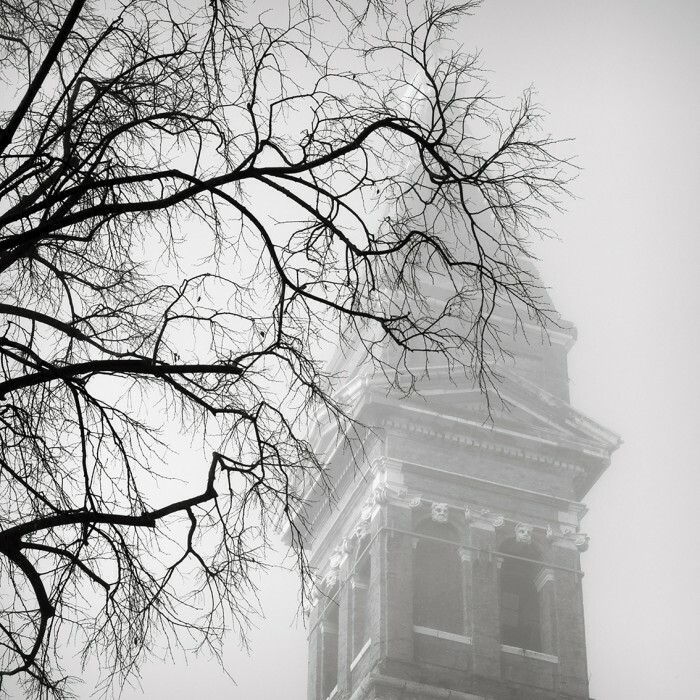 There are many reasons why photographers continue to create images in black and white despite advances in technology. Black and white is timeless and presents a world that is both real and imagined. I also think it’s often more revealing; it signals to the viewer that they should look beyond what can be seen with the human eye. And without the distraction of colour it allows the subject to take centre stage. LR: Any thought about Canaletto and his views of Venice? LK: Canaletto is famous for his highly detailed, realistic paintings of Venice, so I find it fascinating to see how he altered reality to create more pleasing compositions: manipulating space, altering perspectives, removing buildings and even straightening the Grand Canal. Today, digital photography has pushed the boundaries of image manipulation to the extreme and the subject continues to provoke heated debate. I find it interesting and amusing that photographers are sometimes criticised and censured for manipulating images when Canaletto was doing the exact same thing in his paintings almost 300 years ago. LR: What is it that you would not photograph in Venice? LK. Carnevale. I would have to be dragged kicking and screaming to Venice during the festivities, but I know photographers who love the hustle and bustle. Give me deserted squares and fog any day! As well as Carnevale, I never photograph people when I’m in Venice – at least not without their permission. I’m not comfortable with it and I don’t enjoy it. However, if I could converse with people, it would be fascinating to do a series of photographs showing Venetians engaged in local crafts and industries. So never say ‘never’! LR: In Venice there are two large buildings that on the opposite sides of the city dominate it. One is the Doge’s palace. The other one is the Car park Garage designed in the 1930s in Piazzale Roma. Is this Venice for you? Or are there limits beyond which Venice is no longer Venice to you? LK: For me, the boundaries of ‘Venice’ are broad. As soon as I cross the lagoon from the airport and see the bricole and the domes and campanile shimmering on the horizon, I am in Venice! Anyone who visits for a few days and moves only between San Marco and the Salute will return home with a very narrow view of Venice. There’s so much more to discover and, for a small island, it’s surprising how different each sestiere feels. Visiting regularly has also given me the opportunity to explore more widely – from Torcello to Pellestrina, which I love very much. They are all part of the rich tapestry that makes up ‘Venice’. Luisella Romeo was born and raised in Venice. After graduating from the University Ca’ Foscari in Foreign Languages and Literatures, Luisella traveled and studied abroad. Luisella has been a registered tour guide in Venice since May of 2000, when she was officially certified by the Regione Veneto. You can learn more about Luisella and her inventive tours at seevenice.it.